Raw or uncooked eggs pose a potential health risk, especially if you consume them on a regular basis over long periods of time. Eating raw eggs not only increases your risk of contracting disease, it can also cause vitamin and protein deficiencies. Cake batter, cookie dough and any other food that contains raw eggs should be avoided due to the potential risk of becoming ill due to bacteria that is found in some eggs. Eating raw eggs can significantly increase your risk of developing salmonella poisoning, according to the United States Department of Agriculture, or USDA. Salmonella is one of the leading causes of food-borne illnesses in the United States and can cause stomach pain, diarrhea, vomiting, fever and chills. In some cases, salmonella poisoning can be fatal. The USDA recommends fully cooking eggs to kill any salmonella bacteria that may be present. 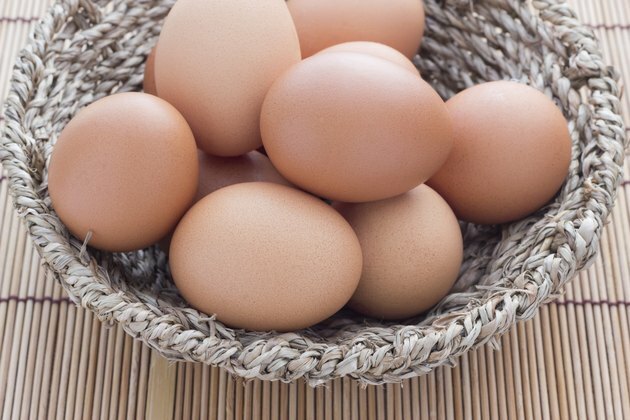 According to the Linus Pauling Institute, eating raw eggs can interfere with the absorption of the vitamin, biotin. Raw egg whites contain avidin, a protein which binds to biotin in your stomach, preventing it from being absorbed by your gastrointestinal tract. Cooking eggs destroys avidin, reducing the risk of developing a biotin deficiency. Biotin deficiencies are rare but can result in problems such as hair loss and skin rashes. Cooking raw eggs increases the bioavailability of the protein in them. According to a 1998 study published in the "Journal of Nutrition," 51 percent of the protein found in raw eggs is bioavailable, meaning only about half of the protein in a raw egg can be absorbed by your body. In contrast, by cooking the egg, the bioavailability of egg protein increases to 91 percent, making cooked eggs a much better source of available protein than raw eggs. Both the USDA and the journal "Nutrition Action" recommend avoiding raw eggs and cooking them thoroughly before eating them. Eggs should be constantly refrigerated and used within two weeks. After handling raw eggs, it is important to wash your hands before touching anything, especially other food, because of the risk of transmitting salmonella bacteria to other surfaces. USDA; Raw and Undercooked Eggs: A Danger of Salmonellosis; C.T. Jordan Lin, et al. Journal of Nutrition; Digestibility of Cooked and Raw Egg Protein in Humans as Assessed by Stable Isotope Techniques; P. Evenepoel, et al. What Happens When Egg Protein Is Cooked? What Proteins Are Found in Eggs? Can You Make a Lasagna & Cook it the Next Day? Is it Dangerous to Drink Raw Egg Whites?